New Yorkers love to talk about three things: the price of their rent, the length of their commute, and the price of your rent/length of your commute. I could turn the three train situation (see here I go talking about commuting!) into just one train if I walked 30 minutes to the direct line. If it wasn’t raining/hailing/snowing and depending on my laziness, I would always choose the walk. When I found out that there happened to be an amazing Italian bakery on the way, guess why I started walking more often (obviously because walking = treat). Out of everything they offered I was most drawn to their overwhelming selection of biscotti and I would always order just one – to go. The woman behind the counter laughed at me the first time. I don’t think she was in the habit of customers purchasing a single biscotti especially since they are sold by the pound; meaning one cookie would set me back a whole $0.25 to $0.35 depending on how generously the baker in the back sliced them. I can do a lot of multi-tasking but dunking (read: properly enjoying) a biscotti into coffee is a near impossible feat to achieve while commuting. For some silly reason you cannot fit a biscotti through the opening of a coffee with a lid, and let me tell you, you don’t want to be that person on the subway at 7:45am with a steaming hot coffee sans-lid trying to savor one single biscotti like you are on vacation at a café in the Italian countryside. No. Guess what, you are on the A-train and stand clear of those closing doors. 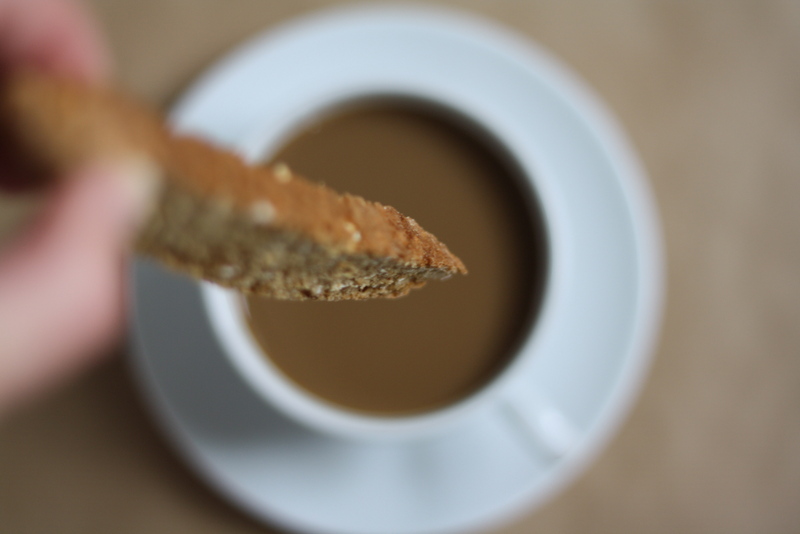 I could write sonnets about the humble biscotti and its love for coffee. What it is like to hold a crisp but tender cookie at the brink of a dunk. So much promise and hope for the morning. 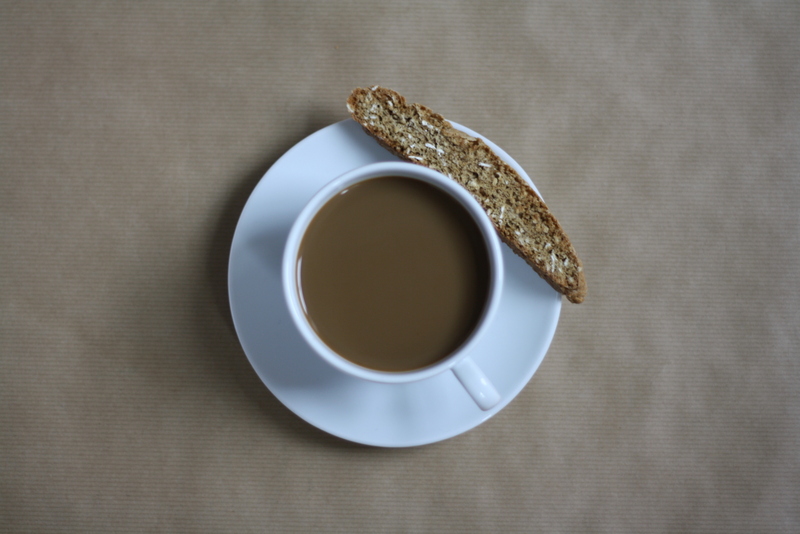 The biscotti falls weak at its knees to warm coffee and I’ll happily sweep them both off their feet. Alas, it is the simple things. I have been dreaming of making an acceptable breakfast time biscotti for many a month now, so would you believe me if I told you this was the first time I had ever attempted homemade biscotti. Why would I try when I live so close to the motherland. Well, okay, perhaps I have made them in my lifetime because I know someone is going to come out of the woodwork and say, “Lillie, remember when we made biscotti that one time and we had so much fun? !” To that I will say: I’m sorry. I have an awful memory and I wouldn’t remember if I made them with you last week. 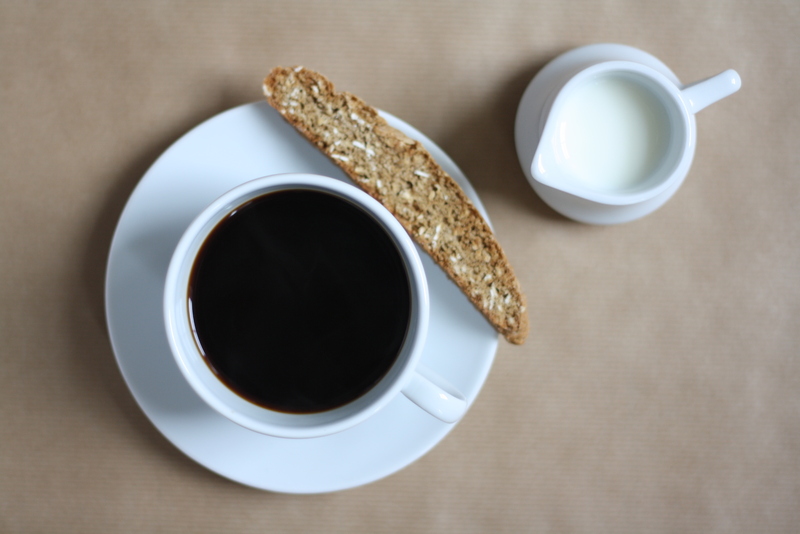 Biscotti have a bad rap because coffee shops in the 90s started making them by the dozen and selling what were essentially teething biscuits for adults. I think we can all agree that no one should ever have to gnaw their way through a cookie full of craisins and whole pecans. If you are thinking to yourself – meh, even after this whole love letter to biscotti I still just don’t like them much – then try these. These are spicy and full of flavor and crunchy but even when twice-baked, they stay tender and have just the slightest bite to them. They are sweetened with brown sugar and maple syrup! They are full of oats and cinnamon! Make a batch and watch as these breakfast time biscotti will make many a winter morning just a little bit better. Preheat the oven to 350. Line a baking sheet with parchment paper and set aside. In a medium bowl whisk together flour, oats, brown sugar, cinnamon, baking powder, baking soda and salt. Measure the maple syrup into a liquid measuring cup then add the coconut oil and extracts. Separate the egg white into a small bowl and set aside – then add the egg yolk to the maple/oil mixture and whisk to combine. Add the wet ingredients – all at once – to the dry ingredients and use a wooden spoon to stir until combined. Don’t fret, the dough will be crumbly. Mix in the reserved egg white and stir until fully incorporated. 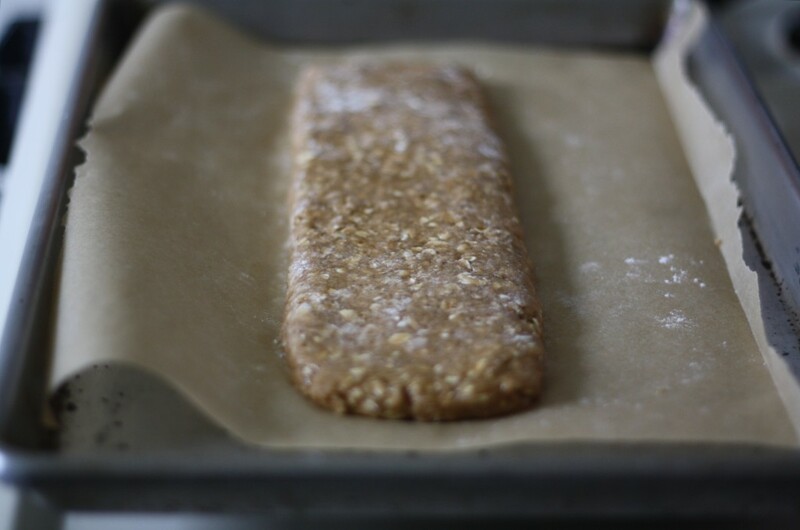 Using lightly floured hands (the dough may be a bit sticky so re-flour your hands as needed) transfer the dough to the prepared sheet and shape into a 12-inch long and 4-inch wide log. Bake for 20 minutes until lightly golden and firm to the touch. Remove from the oven (but leave it on!) and let the log cool until you are able to handle it with ease. Use a sharp serrated knife and a gentle sawing motion to cut the log into 1/3-inch wide diagonal slices. Place the biscotti cut side down back on the sheet and bake for 8-10 minutes more. Let cool completely then serve with a dunkable beverage of your choice. This sounds perfect for coffee dipping! i agree. 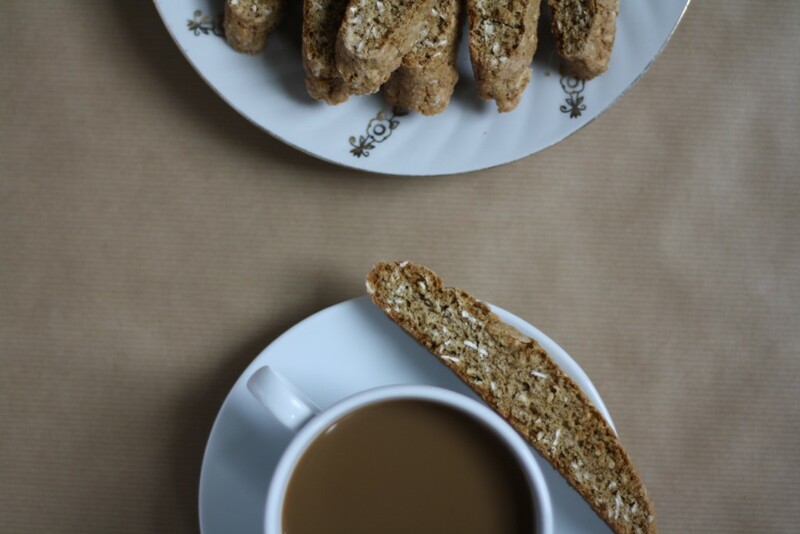 there is nothing better than a anisette biscotti dipped in your morning cafe latte and this one sounds wonderful. i too remember stopping by monteleone bakery for a morning treat. It’s funny. Biscotti in Italian just means cookies or biscuits, but what the word means in English is actually what we call “cantucci”. Cantucci are Tuscan very had cookies, made with no butter or oil and double cooked, first in a long sausage, then cut and toasted on both sides. Because they are so hard, they are meant to be served with some sort of dipping liquid, in general Vin Santo or other sweet wine, as a dessert. They really traveled a long way to become “biscotti”, and yet, the concept is quite the same –the dipping, the complementary liquid, being wine or coffee, is key. 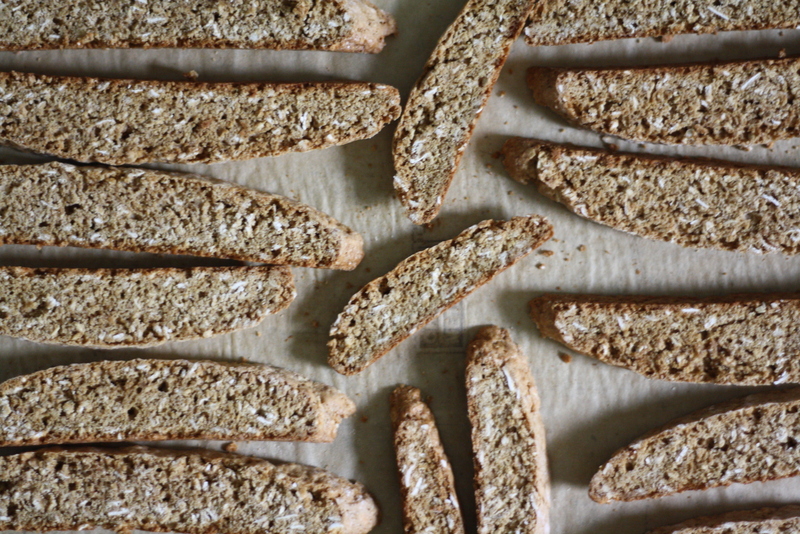 I love cantucci, I love biscotti, they are possibly my favorite cookies, and I will definitely try these. Sorry for the extra-long comment. I loved everything about this. I am making these as soon as I hit the BK and am going to pretend I am still where I am now. Sigh. p.s. I’m still not going to get on the train, though. Aw, loved this post! 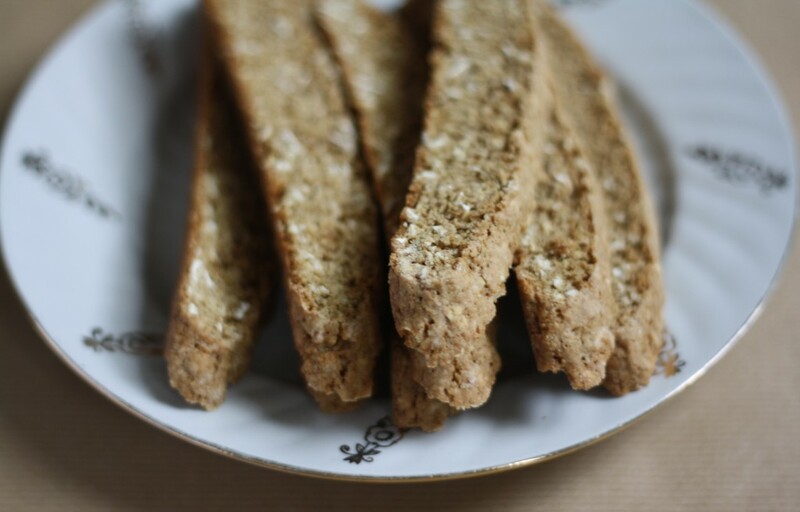 I love biscotti, especially homemade ones, and these sound extra delicious with oats and maple syrup and spices. Yum! I just discovered your blog last week and I love it! I really enjoy your writing, and am looking forward to trying one of your recipes. I too had the 3-train commute! G to A/C to F. Ugh. Then my office moved and I could do the G to E/V, but still. Anyway, I just had homemade biscotti for the first time a couple weeks ago, and were they ever amazing! I’m definitely going to try a batch of these out for myself. 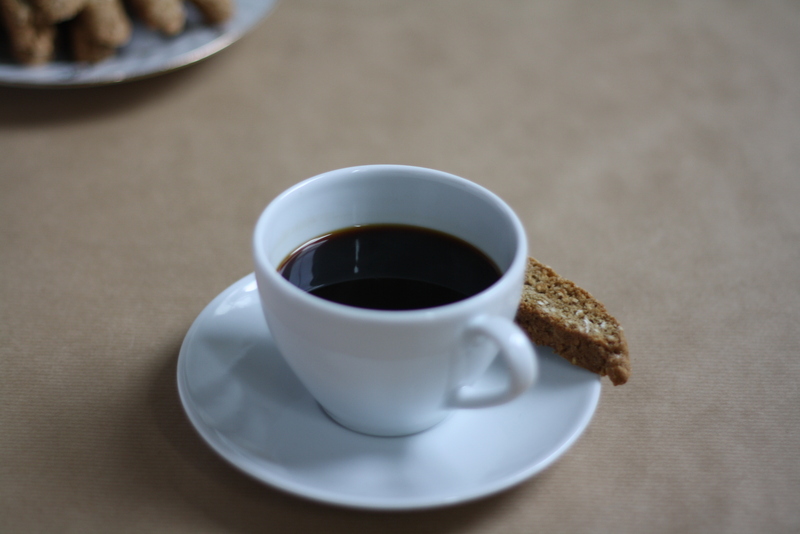 especially gorgeous photos in this post and the biscotti are next on my list. Yes, I think butter would be a fine substitute. I haven’t tested them with butter, so if you make them I’d love to hear how they turn out for you! Happy baking! Yum, these look delicious! And, by the way, this sonnet to biscotti makes me glad I don’t live in NYC! Lille, thank you for the delicious recipe. I made these yesterday and they are a keeper. My batter came out very moist, so I spread it into a “log” ,rather than formed it, on the baking sheet. They still came out light and crunchy and flavorful. I am always on the lookout for cookies that store well and are mailable. These are great. Thank you Wendy! I’m glad they were enjoyed and your post looks wonderful! This post made me laugh out loud. And I think I know that bakery. Or at least a comparable one in your current ‘hood. My mom’s suitcase home from trips visiting me in BK would be stuffed with biscotti, purchased by the pound. Yes – I know that bakery!! And I have indeed purchased three biscotti “by the pound”. And – I have heard countless conversations about the benefits of the A train versus the 3, etc. It can go on forever! I’m trying this recipe. I love making biscotti. Haha! Yes, the subways and talk of the commute never loose converstation value! Thank you Sophia! 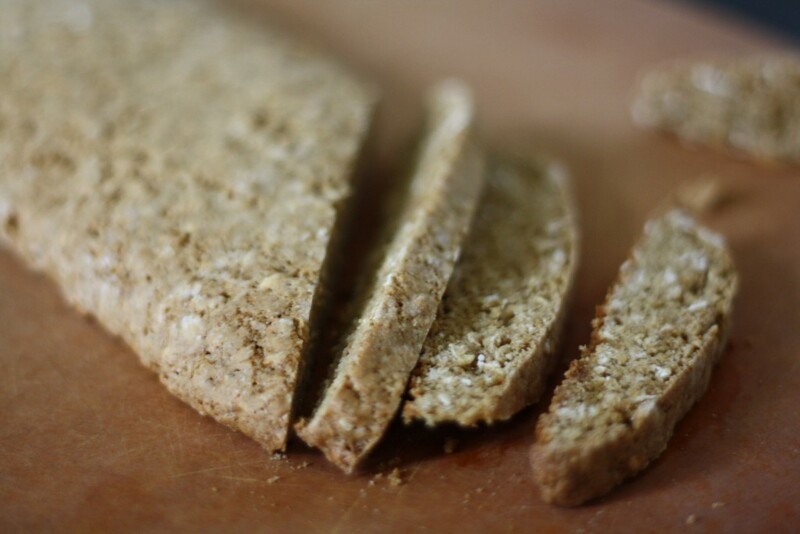 They do taste like a bit like a cross between an oatmeal cookie and biscotti! Happy baking! Love this recipe and the photos are great. I just discovered your blog. Love the recipes and your charming writing style. Looking forward to more. I tried the biscotti recipe and it is wonderful just as written. I did sub canola oil for the coconut (didn’t have) and they seemed fine.